An American rock band, best known for the song "Are You Ready?" released in 1970. The band's history dates from 1967 in Los Angeles. Self-taught guitarist Tom Marshall met bassist Brent Block at a party thrown by Block's former art teacher and formed a band then named "Pacific Gas and Electric Blues Band". It was one of the first multiracial bands to be part of the Los Angeles music scene. An early member was Charlie Allen (May 1, 1942 - May 7, 1990), a drummer from Baltimore, whose vocal abilities were so good that he moved from drums to lead singer, and was replaced on drums by Canned Heat's former drummer, Frank Cook, who had earlier signed to manage the band. In 1968, the band name was shortened to "Pacific Gas & Electric", and included Allen, Cook, Marshall, Block, and guitarist Glenn Schwartz (also of James Gang and All Saved Freak Band). They released their first album, Get It On, that year on the Power record label (it was subsequently released on Big Orange, Kent and United Superior as well). Although it only reached #159 on the album charts, someone at Columbia Records was listening, as they signed the band to a recording contract shortly after their appearance at the Miami Pop Festival in December of 1968. 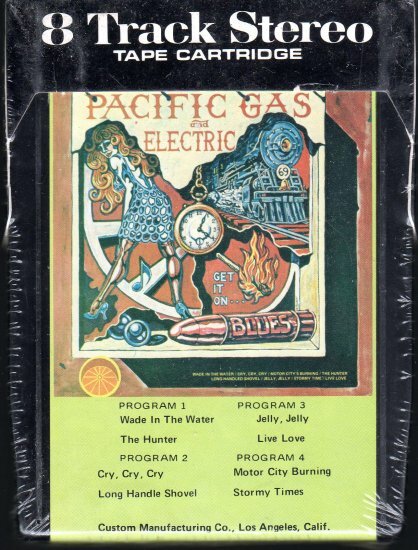 The next album, and the first released by Columbia, was simply called Pacific Gas and Electric (1969). However, it was the next release, Are You Ready, that included their first mainstream hit. The title track reached #14 in the summer of 1970, and featured the backing vocals of The Blackberries. Wholesale changes were in store for the group after recording the Are You Ready album. After a serious car accident, Cook was replaced on drums by Ron Woods, and he stayed on as manager. Schwartz announced his conversion to Christianity onstage during a concert and then later joined the All Saved Freak Band. Marshall also left, and the two were replaced by Frank Petricca on bass and Ken Utterback on guitar, with Brent Block moving to rhythm guitar from bass. This is the line-up that toured in support of Are You Ready. This version of the band recorded a self-titled album in 1971 (minus Block, who had left the band in late 1970), adding Jerry Aiello on keyboards, trumpet player Stanley Abernathy, sax players Alfred Galagos and Virgil Gonsalves, and percussionist Joe LaLa. At the request of the utility company sharing the same name, the band name was shortened to "P G & E". The band did countless concerts, often appearing with other big musical acts of the era. At one P G & E show, writer and film producer Lawrence Schiller filmed his documentary, The Lexington Experience. Disagreements with the owners to the rights to the music caused the film to be shelved after only a few showings, and the only copies known to exist are in Schiller's vault. They made more movie history when they appeared in, and provided music to, the Otto Preminger film Tell Me That You Love Me, Junie Moon, starring Liza Minnelli. Their song "Staggolee" was also featured in the Quentin Tarantino film Death Proof. After 1972, the group's line-up became unstable, resembling more of an Allen solo project. One more album was forthcoming: ...Starring Charlie Allen in 1973 on the Dunhill label, featuring Allen and a host of studio musicians. Because this tape is sealed new and we cannot inspect for play-ability, we offer no warranty or guarantees on how well this tape will perform once it is opened and removed from the cellophane package. Because this sealed new 8-track tape is very old, the foam pad and glue on the foil splice most often has a tendency to deteriorate over many years of time. Always inspect and replace if necessary those items before playing any sealed new 8-track tape, or damage to the tape and player may occur. If you would like this new sealed tape gently opened and inspected for play-ability with a new pad and foil splice added, please go to "New 8-track tape repair" in the New 8-track tape category and we will gladly perform the work for you. Please be sure to select the number of repairs needed for the amount of sealed tapes you are purchasing.